At a demonstration, Faith Bandler (right) and her daughter Lilon (2R) appeal to national unity as grounds for constitutional amendment. The referendum attracted more than 90% of voters in favour of deleting the two references to Aborigines in Australia’s Constitution. Campaigners for a “Yes” vote successfully argued those references were discriminatory and debarred Aboriginal people from citizenship. 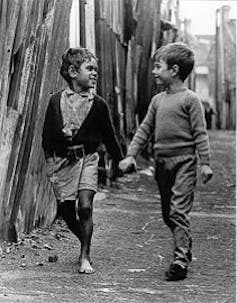 Ever since, and as we approach the 1967 referendum’s 50th anniversary, it has been popularly remembered as the moment when Aboriginal people won equal rights – even the right to vote. In fact, the referendum did not secure those outcomes. 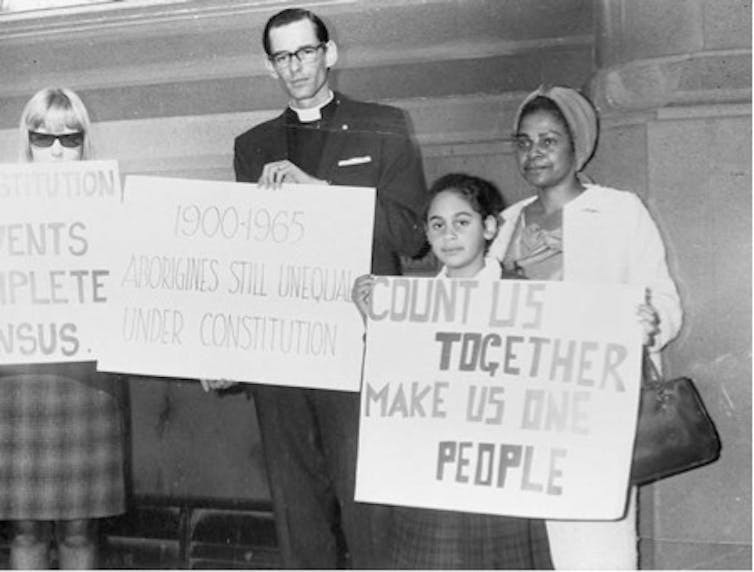 By 1967, all Aboriginal adults already held the right to vote in federal, state and territory elections. Racial discriminations had been removed from the statute books at the federal level and in all states and territories except Queensland, Western Australia and the Northern Territory. And even those three laggards were moving toward legal equality. Constitutionally, the 1967 referendum secured the amendment of Section 51 (xxvi) and the deletion of Section 127. … people of any race, other than the Aboriginal race in any state, for whom it is deemed necessary to make special laws. The words “other than the Aboriginal race in any state” were deleted. … reckoning the numbers of the people of the Commonwealth, or of a state or other part of the Commonwealth, Aboriginal natives shall not be counted. Neither section prevented Aboriginal people from exercising the same legal rights as other Australians. The rights of Aborigines were abridged not by the Constitution, but by laws enacted by federal and state parliaments. Two days before the referendum, the Sydney Morning Herald published this photograph. Campaigners for a “Yes” vote, however, told a different story. They insisted constitutional change was a necessary precondition for Aboriginal equality. Yet the campaigners’ ambitions went beyond legal equality. They sought the inclusion of Aboriginal people as respected members of the national community. This had been a principal goal of Aboriginal and pro-Aboriginal activists since the early 20th century. The 1967 referendum was the culmination of a long struggle for rights and respect, for social esteem as well as equality before the law. Vote “Yes” for Aborigines, they want to be Australians too. Effectively, the proponents of a Yes vote transformed what could have been a dry, legalistic tinkering with the Constitution into a plebiscite on Australian nationhood. In achieving this transformation, the campaigners held an unusual advantage. 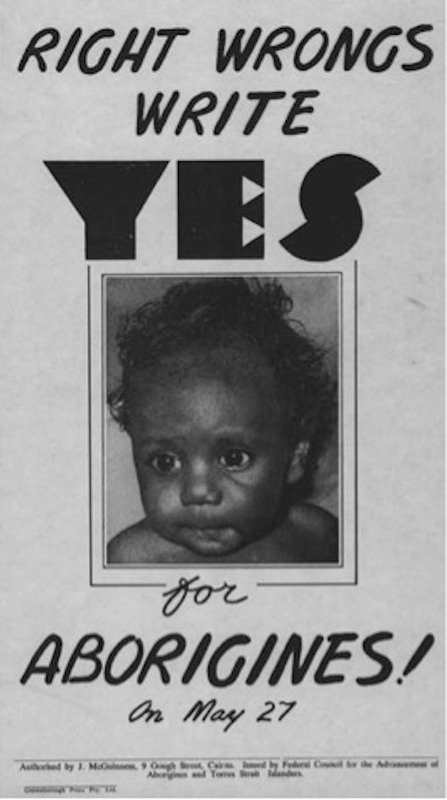 Uniquely among Australian referendums, for the 1967 question on Aborigines there was no campaign for a “No” vote. And even the government broke with convention by providing, in the official advice to voters, only the case for “Yes”. Consequently, campaigners could talk up the importance of the changes they advocated virtually unrestrained. When you write Yes in the lower square of your ballot paper you are holding out the hand of friendship and wiping out nearly 200 years of injustice and inhumanity. Hyperbole of this kind is not unusual in political campaigns. What was unusual is that there was no organised opposition to contest the claims of the Yes campaigners, or to counter them with equally extravagant rhetoric for the negative. Much of the publicity material for a Yes vote was couched in broad terms of rectifying past wrongs. The lack of a “No” campaign undoubtedly boosted the “Yes” vote. It was equally important in shaping remembrance of the referendum. Lacking an opposition, the “Yes” campaigners had a virtual monopoly on the narratives about what the referendum meant. Their expansive conception of the referendum as a plebiscite on nationhood prevailed. The triumph of the “Yes” vote was primarily a symbolic victory. It did not win rights for Aborigines, and the government of the day did not utilise the extension of Commonwealth powers secured by amendment of Section 51 (xxvi). Nor did Gough Whitlam’s government after it came to power in 1972. Whitlam did, however, invoke the resounding “Yes” vote of 1967 as a moral mandate for change in Aboriginal affairs. … evidence that Australians recognise Aborigines are part of the nation. As Nicholls knew from three decades of involvement in Aboriginal politics, recognition of his people as part of the nation was a hard-fought achievement. Regardless of its slight legal consequences, the 1967 referendum was an important event in Australian history. It was a symbolic affirmation of Aboriginal people’s acceptance into the community of the nation. Yet the referendum affirmed only the broad principle of national inclusion. On how that principle should be translated into practice – on the terms of inclusion – the referendum was silent. Indigenous children depicted in an etching playing the game of marngrook, which some have claimed inspired the game of Australian rules. 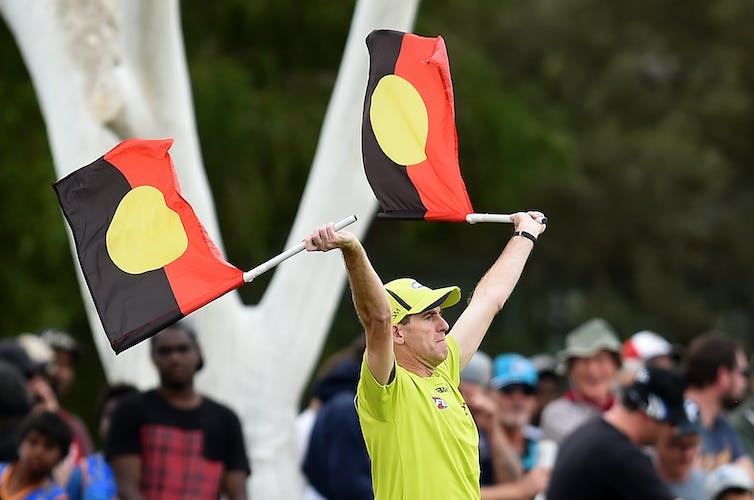 It would be wonderful if there was a connection between the Indigenous games of ball and football – like marngrook and pando – and the codified game now known as Australian rules. But, despite several attempts since the suggestion was first raised, no-one has been able to show anything other than the vaguest similarities between some features of the Indigenous games and what the white men were playing in the 1850s and 1860s. The notion of a personal conduit through Tom Wills, the only one of Australian rules football’s founders with the slightest connection with Indigenous games from those years, was advanced and amplified later. But it is not supported by any evidence in Wills’ quite extensive writing, nor by the innovations he introduced into the game or sought to bring about. The current revival of the idea of Indigenous influence on football’s origins diverts attention from another, much more uncomfortable and largely untold story about Indigenous relationships to football in the second half of the 19th century. Indigenous people who played their traditional games, particularly in regional areas, saw or interacted with the white men at football. They would probably have been involved in it very quickly if they had been allowed to do so. But since they were effectively kept out, they formed their own teams and played with each other, or tried to break into local activities or competitions when they could. This story can be partially gleaned from evidence already available in the colonial archive. It returns a better explanation of why some Indigenous people today believe the game had a history in which their predecessors were deeply involved to whatever extent they could be – given their scarce numbers in Victoria, and the locations on the periphery of the colony where they were effectively confined. It is more powerful, more persuasive and more noble. On the eve of this year’s AFL Indigenous Round, it has potential to give an indication that those people who tried to break into the white men’s game before 1900 are the real heroes – not Wills. Did football borrow from Indigenous games? Football as codified in Melbourne in 1859 was only “a game of our own” initially in the sense that it was based on a cherry-picked selection of very few of the rules of various English public schools, particularly Eton and Rugby. It was a very simplified form, with only ten rules in 1859. These rules allowed limited handling, but no throwing of the ball, and there was no offside rule. 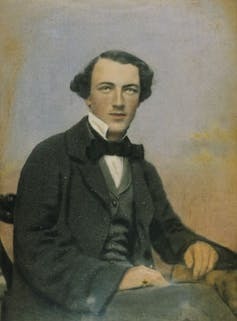 Tom Wills was one of the pioneers of Australian rules football. Nothing in Wills’ voluminous correspondence with the newspapers and with his family and friends offers the slightest hint of any borrowing from Indigenous games. Nor, more importantly, do any of the tactical and legislative innovations he introduced or suggested in the formative period of the domestic game. The pattern of the game as played in the 1850s and 1860s bears little resemblance to the modern game of Australian football. It was a very low-scoring, low-level kicking and scrummaging game. Weight and strength counted for more than any ability to jump or initially to run with the ball. Positional play and carrying the ball came in before long, and Wills was involved in pioneering both. But these were not features of marngrook. In 2016, Jenny Hocking and Nell Reidy wrote the Australian game was different from the English games. The ball was kept off the ground to avoid or reduce injury – and this shows Indigenous influence, they claimed. The noble art of hacking an opponent’s shins, tripping and holding were the main causes of injury. These were gradually banned by the rules, though they did not disappear as a result. In the mid-1860s, Wills was still in favour of hacking, which was allowed under Rugby School rules. But he could not convince his peers to allow it. Far from any of the Hocking and Reidy argument pointing to closer links between marngrook and Australian football, it simply reveals the gulf between pre- and early-contact Indigenous games and what the white men did. Why the claim for involvement? Several scholars have drawn attention to attempts, some successful, by Indigenous players and teams to break into the white men’s games. Nobody suggests Indigenous Australians invented cricket, yet they formed the first Australian team to tour overseas in 1868 – and Wills coached the players involved a year earlier. It does not demean Indigenous players in any way to suggest they learned the white man’s game and then tried to take part whenever they could. They were largely excluded from involvement because there were so few of them. They were restricted to remote areas. And they were subject to the control of the “protectors” and others, and the barriers imposed by the white cricket clubs and their memberships. Indigenous people were being “ethnically cleansed” by settlers, disease, neglect and policy. If they could not protect their country, fundamental to their being, how could the few survivors penetrate the white men’s effective bans on their absorption into settler society? Despite that, a pioneering few managed to work their way into the local code of football. It is these people who should be researched and recognised: they are the real heroes. The key reason Indigenous players were unable to take part in football in significant numbers from 1860 onwards is primarily demographic. By the 1860s, the Indigenous population of Victoria (where what became Australian rules was played) had been reduced to a few thousand. Most were in the remoter parts of the colony or in reservations under the control of the “protectors”. If, as recent demographic history suggests, around the time the Europeans arrived there was population pressure in Victoria, then the subsequent destruction of the local nations must have been appalling in its severity. If careful recalculations are correct, there may have been around 60,000 Indigenous people in the land area of the later colony of Victoria in 1780, but only around 650 as calculated in the census in 1901. This is a decline of nearly 99%. What complicates that calculation is the existence of significant numbers of people who were not counted as Aboriginal and did not identify as Aboriginal in any administrative source. The so-called Half Caste Act of 1886 defined non-pure-blood Aborigines as non-Aboriginal and insisted they be removed from the reservations and become ineligible for public support on the eve of the great depression of the 1890s. This effectively “disappeared” a significant number of people. Such people had every incentive not to identify themselves as Aboriginal. The AFL will pay tribute to Indigenous Australians’ involvement in football this weekend. Our interpretation may help explain why, to this day, Indigenous people believe Australian football is their game – not because they invented it or contributed to its origins, but because they forced their way into it, despite all the obstacles, in the second half of the 19th century. Particularly in regional and remote areas, they had more success in doing so either as individuals or by forming teams to compete. Sometimes they monopolised the game in their locality, and word spread about their capacity to play and beat the white men at their own game. And yet here in Bendigo, the “pivot” of Australia, was to be witnessed the sight of its best team of footballers having rings run round them (and those very literal ones) by the despised and fast-dying Aboriginal. Indigenous Australians’ claim to the game of Australian football comes by virtue of participation at grassroots level in the 19th and early 20th centuries. Some of the skills they had honed long before the white men arrived could be used to develop different ways of playing the game: speed at ground level, rapid hand movement and brilliant hand–eye and foot–eye co-ordination, plus physical play, as well as high marking. 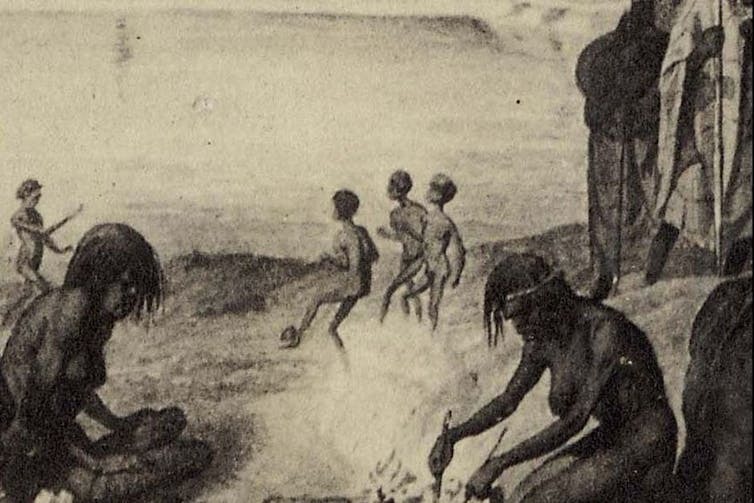 The oral tradition has always had difficulty with precise chronology, so modern-day Indigenous people relying on the stories handed down through the generations find it very hard to pin down when key developments occurred. It is not unreasonable, then, to conclude it was in the second half of the 19th century that Indigenous Australians began the prolonged process of infiltrating the white man’s game of football and, most importantly, making it their own. This piece was co-authored by Athas Zafiris, a freelance researcher and publisher of football and popular culture website Shoot Farken.